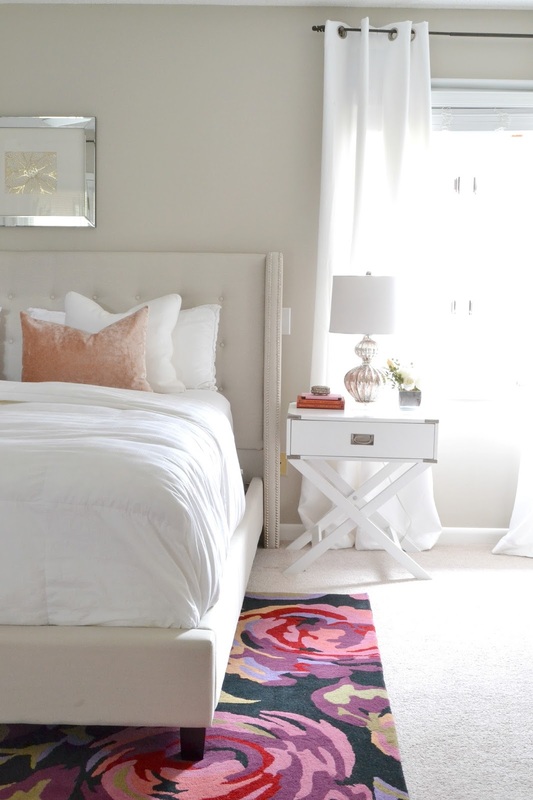 LiveLoveDIY: Master bedroom decorating updates! 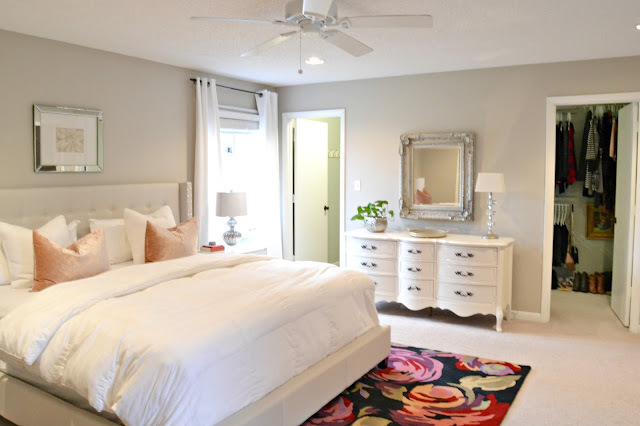 So, I changed our master bedroom a little bit, and I thought I would pop in really quick to share a few pics of the updates with you guys. I've posted about this bedroom so much that I'm going to spare you the exhaustive details (assuming you are an old pal and already know the birth story of this room) and instead just share some of the pics I took. There's not much to talk about anyway. All I did was add a new rug and spend 20 minutes cleaning piles of laundry off my bed. But, you know, sometimes that alone is worth a post. Especially during these trying times of child rearing and blog drought. 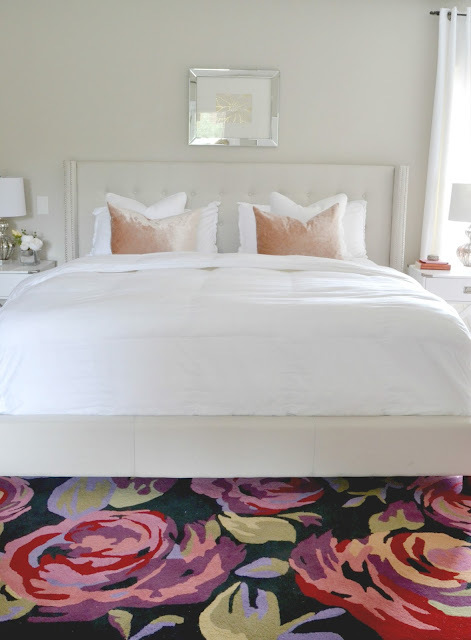 The fabulous new rug is the Prescott Painted Roses rug from Rugs USA, and I love being able to have everything else in this room really neutral and muted, and then have this one big statement piece. Although, one of the handles on my dresser broke and I'm looking for something to update the hardware with. No luck so far with my search for replacement french provincial hardware. Holler if you have any hot tips. Also, I probably need to paint that weird under-leg, and I'm probably never going to do that. Also, I'm pretty sure there is some trash under that dresser and I'm just going to leave it there. Both in real life, and in that picture. And here's a wide shot of the room. I swapped out our chandelier for a little ceiling fan, too. Not because it looks good, but because I'm a mom now and I need to feel some wind on my face. So, that's pretty much it, you guys. I told you....nothing major....just a sassy new rug that I'm really loving right now. In Ava related news, there's a tent in my living room that she's obsessed with. Occasionally, Jesse and Tootie squeeze in there with her, too. It's pretty cute. She's starting to dance when we play music. 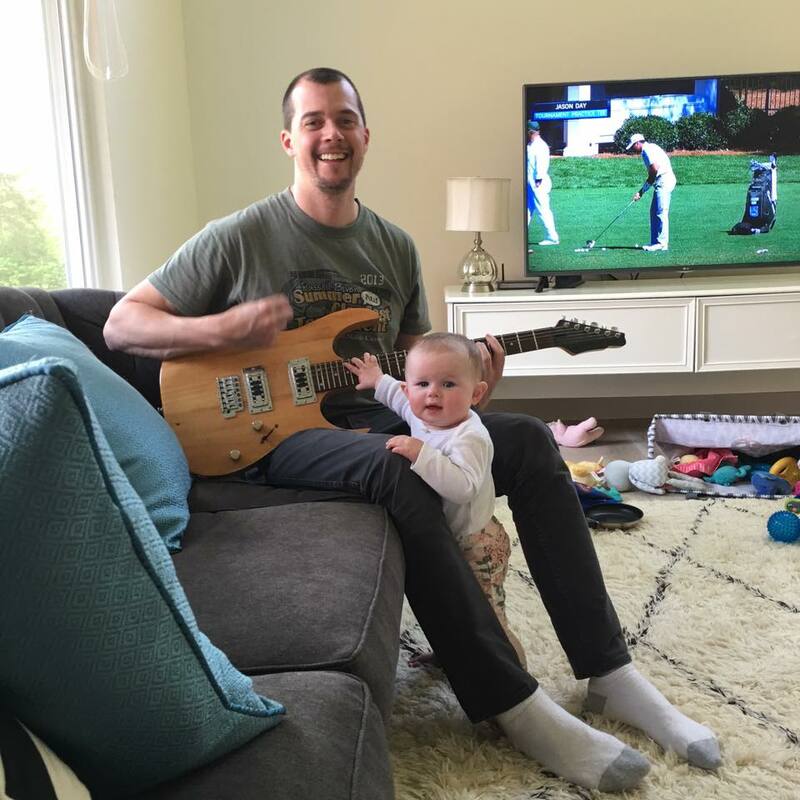 She loves it when Jesse plays the guitar for her. And that's all for today, ya'll. Thanks for being here. Beautiful bedroom and even more beautiful baby! We call the 'trash', that ends up under furniture, cat toys. It is totally believable that the cat got it under there and will eventually get it back out! ;) So glad to see your post! And your cutie pie! I love the new rug, definitely worth the update, it has changed the whole feel of the room! I love it! Your blog posts always make me laugh. Thanks for being so real! Also, your baby girl is super cute. Also, also - I am digging all the fab updates to your house! Why aren't there any ceiling fans that are as beautiful as chandeliers? We moms need those in our lives. Lol!! "I am a mom and need the wind on my face". I have always wanted chandeliers in our bedroom, but being pregnant and due in the summer I am finally content with the ol' fan. Not super pretty, but totally functional and necessary for these times of life. Also: what a cutie!! I had my first girl 10 years ago, so sweet! I love that rug!!! And Ava gets cuter every time I see her! Love this. Where did you get the baby tent? I'd love to have one. Looks fantastic! Love the pop of colors against the neutrality of the rest of the room. I love the new rug. That little girl is gorgeous. Seeing the progress of your house really makes me want my own house! Someday, that dream will come true and I'll rifle unceremoniously through your posts to make my house gorgeous too. And I love the mini-updates about Ava. She looks just like you! HI Virginia, Thank you for the update. Your daughter is adorable! And, I love the rug! Isn't it funny how our priorities change once the children come along. LOL! Garbage under the dresser, piffft! Your house looks amazing! Where is the tent from? Need to get one! LOVE that you're playing music early for her! My hubby and I are musicians and we started playing music for our kids while still in the womb. It paid off :-) They're both great musicians themselves and one of them is a professional guitarist. So yay! Keep up the great work instilling the love and appreciation of music! Where is that pretty bedding from?? It's so simple but elegant and relaxing. Love that new colorful rug too! Great pop of color! That rug is definitely blog worthy! The room is lovely. Love your blog. So happy to hear about your precious baby girl, she is a doll. I have enjoyed watching your decorating evolve and seeing what you are doing to your home. I enjoy even more hearing about your adventures in motherhood.......nothing like being a mom. Your room looks lovely, as always. The rug is stupendous! It adds quite a pop of color and great for bringing in accessories here and there. That's one gorgeous family you have there. I always look forward to your blog alerts whenever they arrive. Don't fret over the infrequency...just enjoy your family. That's the most important part of life. You have already done so much(so beautifully) with the house that you've shared with your readers. Enjoy LIFE! i do like the neutral calm of your bedroom with the splash of rug! if you can take a close up of the broken dresser handle and the measurement of the hole spacing...i may have some hardware in my stash that i could send you. i bought out a huge lot of old hardware from a friend who up cycled furniture before she moved away. fingers crossed! Haha I would have never noticed the trash under the dresser 😂 Or the rogue support thing (whatever that is called). There is an etsy page that sells only French provincial dressers. They are way too expensive, but sometimes I like to just look at them because they have SO many. Check out this one particular one, the middle drawers have different knobs! They may also have replacement knobs that they sell. Either way, at least enjoy the eye candy! I love the statement rug. The muted tones of the bed are so inviting, too. Love it all and especially seeing you doing well and your beautiful family! It's beautiful!!! I get so excited to see a livelovediy post! Also, thanks for mentioning Rugs USA a long time ago-it's my go to now! What size is your snazzy new rug? Thanks for the new pics!!! Oh you are such a true artist. That splash of rug does make the statement! I truly think you have such an eye for what you like. Your ceiling fan is unique and looks great. In my state I don't think I could survive without one so no chandeliers in bedrooms here. I've come to accept mine and they do not wobble at all and look nice so I'm pleased. I have that fear of having someone take it down to do something to the decor and then it wobbles. Ha. But I find it hilarious in a way. You point out flaws. I felt like I was playing Where Waldo. Broken handle. Oh it must be behind the bed in photo. Leg unpainted. Where??? I was admiring the top of your dresser and then realized oh it includes one of those good air cleaning plants we all grew in the '90's because they were the in hing not because it came up in someone's Facebook feed. So I'm planning to add more than my two to the small house. And so I gaze upon that. U do it well. And your darling baby girl? I don't mind if you use her as a reason to be in blog drought any time!! 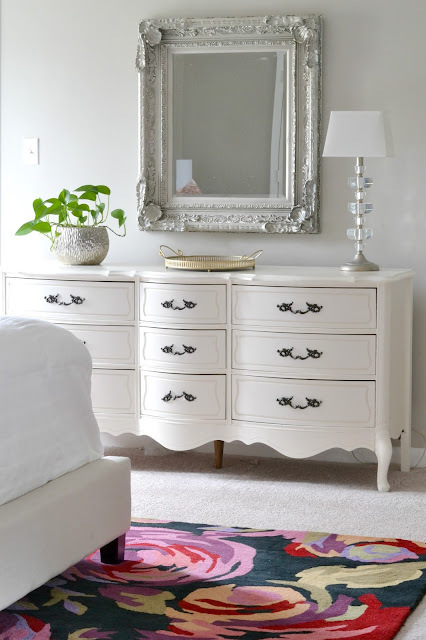 I love your blog and the the evolving bedroom is fantastic. I am constantly "tweaking" my own home and love that someone else uses the figure it out as I go method. Your daughter is a cutie. Etsy was a great resource when we needed to replace our french provincial handles. I LOVE the clean, touch of feminine in your master bedroom, how is Jesse with that? He's quite a great man, and husband for it. My husband would roll his eyes, and say, "Ummmm... really?" She's adorable!! I have always loved your style!!! Keep more coming especially on little Ava. Ohmigosh, Ava totally has your smile! Such a cutie! 😘👶🏼 cuteness!!! Happy tooth breaking!!!! Love the rug, don't always comment, but love your posts! I love your little tot's chubby little hands....enjoy and take in as much as you can. Oooh, I love the rug! And your lamps are so pretty too. I like how they're not matchy-matchy but still go together. Thanks for sharing! Beautiful room, and oh my goodness what a darling baby! Hi Virginia! I've been obsessed with your blog lately! I'm 17 weeks pregnant and in a TINY, gross, almost un-renovated rented house from 1948. Seriously, gas leaks and mice holes galore and everything. We are either buying a house this summer or moving to another state and renting for 3 years (military). Anyway, I'm so excited to move and start "nesting" and your blog has been such an inspiration!! Thanks for all the renovation tips! 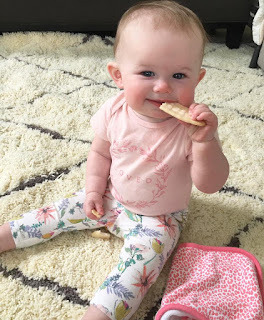 Your style is lovely, you are hilarious, and your baby looks so full of life and is ADORABLE. Cheers!! Virginia, you guys are a sweet (and good-looking!) family. Keep up the good work. The room looks great, and I love your remark about the ceiling fan! Virginia! Saw your home in the Knoxville RE listings this morning! What goes on, or what did I miss? Love the pix. Beautiful home! I'm sure it will sell quickly! Love your blog! I found your original post from 2013 on Pinterest about the room and then came on to the most recent update. This is exactly how I decorate.... little bits here and there, always fiddling. Thanks for sharing! You can make a replacement handle with oven-bake clay--press the hardware into the clay and bake it to make a mold, then press fresh clay into the mold you made (put baby powder or something in the mold so the fresh clay will release), and then bake your new handle. You can reinforce it with some wire while the clay is still soft. Sand it gently to neaten the edges then spray paint it to match the metal hardware. It may not hold up to lots of heavy use, but it will look the part and if you're not rough with it, it should be fine.